The Treasure Site®, Inc., in partnership with Geographic Expeditions, presents Treasure Trips. For inquiries and reservations, please contact the trip organizers for our current scheduled trips with Geographic Expeditions. Sanjay Saxena, Regional Director for India is a native of New Delhi. Son of a brigadier general in the Indian Army, fluent in Hindi\Urdu, Nepali, and English, Sanjay has lived and traveled all over the subcontinent. His deep, insiders' knowledge of his homeland and his talent for creating handcrafted itineraries to traditional and little-seen destinations make him one of the travel world's ranking India specialists. A graduate in physics from Delhi University, Sanjay began his Himalayan mountaineering career at the age of 15 after attending the Nehru Institute of Mountaineering. A professional guide since 1979, Sanjay has led trekking and touring groups to Kashmir, Ladakh, Zangskar, Garhwal, Sikkim, Nepal, Bhutan, Tibet, and Mongolia. His 200-mile whitewater descent of the Brahmaputra River in 1992 was filmed for the BBC series "Classic Adventures" ad was shown on the A&E network in the USA. Vivian (Vivi) Mayer, Country Manager for India and Nepal was born in Santafe de Bogota, Colombia. Vivi began her travel life early, first to Miami where she spend much of her childhood, then north to Tufts University in Massachusetts, where she graduated with a degree in Engineering, and then on to the greater world. She has lived in France, England and the Middle East, as well as ventured far and wide around the globe. A graduate of the NOLS course, she is a fervent ourdoorswoman, an avid cultural student, and has "a passion for giving people the opportunity to experience the wonders of the world and the simplicity, yet complexity of the nature that makes it up." 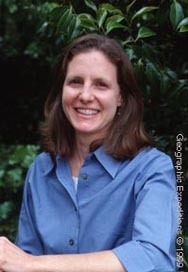 Starr Barron joined Geographic Expeditions in 1994 and has since risen to the ranks of Regional Director. After graduating with a degree in Tourism and Recreation from the University of Colorado, Starr worked in member services for PATA (Pacific Asia Travel Association). To gain first hand knowledge of the travel world, she embarked on a fascinating journey that took her roaming throughout Asia and the South Pacific. Since then she has expanded her travel curriculum vitae sailing the coast of Turkey, trekking in Peru, and exploring Costa Rica and the Galapagos. Starr heads our Turkey, Italy, Patagonia, Peru, Costa Rica, Ecuador & Galapagos programs. 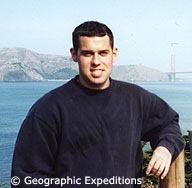 Brady Binstadt joined Geographic Expeditions in May of 1999 and is now the Country Manager for our Latin America, Turkey, Alaska, Antarctica, and Japan programs. He has traveled and worked throughout Europe and South America, including a year-long stint teaching English in several idyllic Chilean towns. There he developed a love for the Spanish language and the history and cultures of Latin America. Brady graduated from Miami University (Ohio) with degrees in Psychology and International Economics. The Treasure Site®, Inc. owns the trademarks for Unlock the Universe®, and The Treasure Site®.